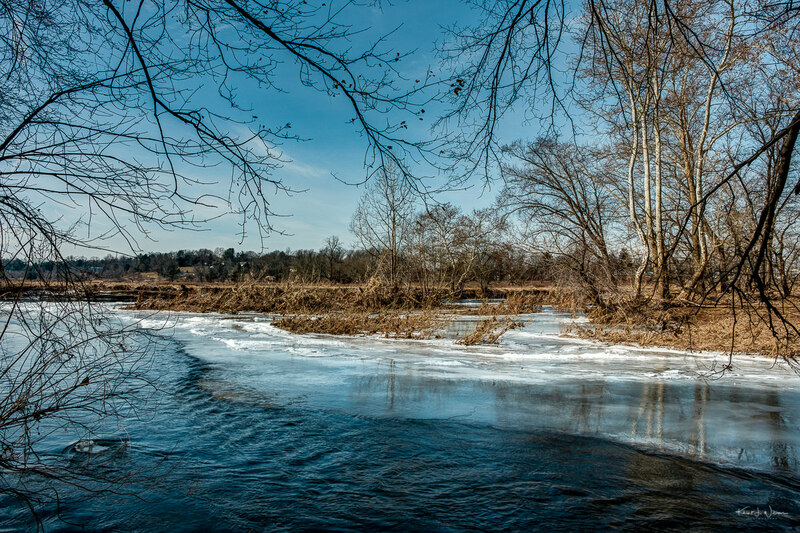 While on my way to photograph the South Branch School House yesterday, I noticed the ice floating on this section of River Road along the Raritan River in Hillsborough. I could the river through the trees, which only caught my eye because the trees had no leaves. Even though I have driven along this section of the river in the past, I don’t recall noticing before, perhaps because the trees were full of leaves. I made a mental note that, after photographing the schoolhouse, I would stop somewhere nearby and walk along the river. I parked in the parking lot of the South Branch Bible Fellowship building on Orchard Road and walked back toward the river making sure to carefully cross River Road. I walked along the south-west trail noticing a large number of fallen trees. 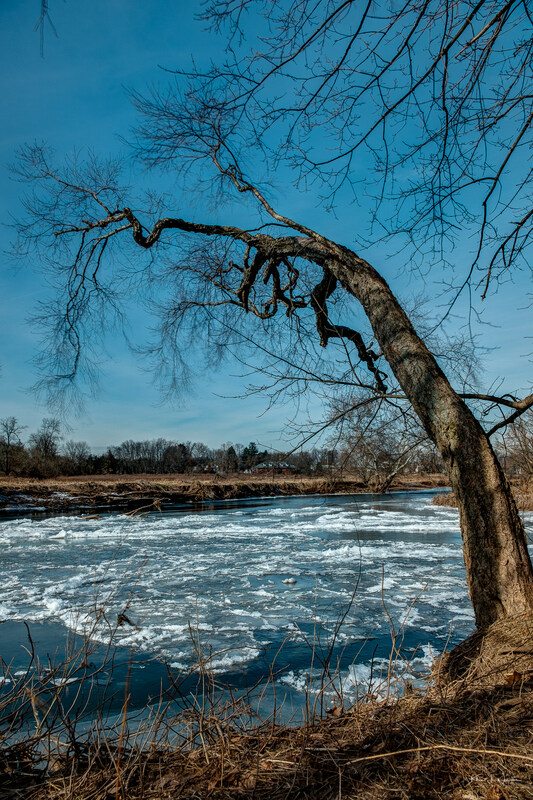 I walked closer to the edge of the river which I noticed had a steep drop from what is perhaps erosion from water from when the Raritan River was flooded. I noticed that many of the trees were hanging from the edges of the river bank, barely staying upright. This image is from the set I used for Frank Jansen’s weekly photo challenge. Best Photo of the Week is personal photography project where I post the best image captured that week. The image will be posted at the end of the week. That will be a Sunday. I can take one or 100 photos for the week but I will post only one, the best one. 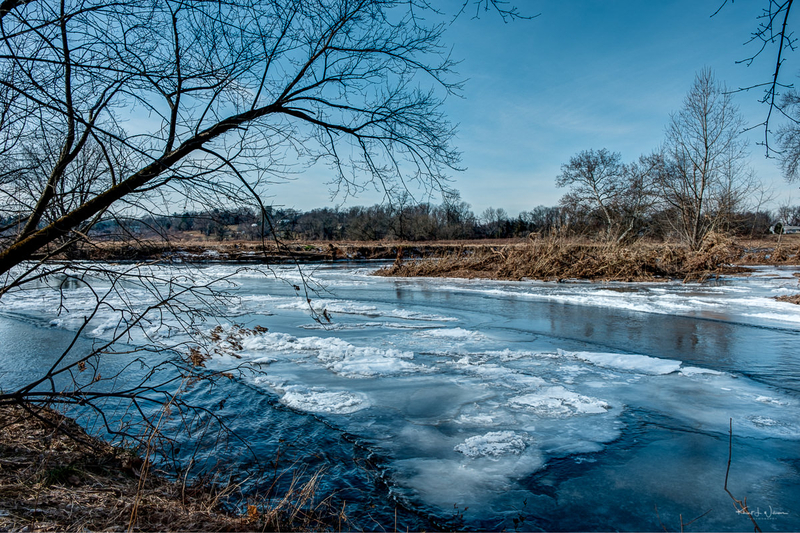 While on my way to photograph the South Branch School House yesterday, I noticed the ice floating on this section of River Road along the Raritan River in Hillsborough. I could the river through the trees, which only caught my eye because the trees had no leaves. Even though I have driven along this section of the river in the past, I don’t recall noticing before, perhaps because the trees were full of leaves. I made a mental note that, after photographing the schoolhouse, I would stop somewhere nearby and walk along the river. I thought that perhaps I could capture something interesting for Frank’s weekly photo challenge. The keyword was rose and perhaps I could find something rising up from the Raritan River. I parked in the parking lot of the South Branch Bible Fellowship building on Orchard Road and walked back toward the river making sure to carefully cross River Road. I walked along the south-west trail noticing a large number of fallen trees, some of which blocked the path ahead entirely. 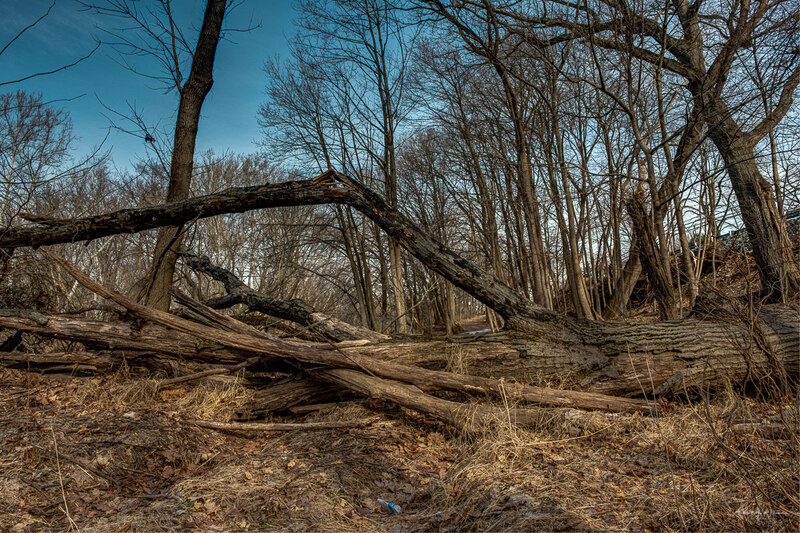 I was forced to clamber over the large trunk of a fallen tree whose now-dead branches were twisted in many places. If a tree falls in the forest, does it make a noise? If trees could make noises this one would have howled out in pain. I gingerly walked closer to the edge of the river bank. There was a sudden and steep drop off from what is perhaps erosion during heavy rains when the water rose up. In some spots along the bank, I saw small, steep and very gravely paths that led down to the water’s edge. I decided against using the path. I was carrying a camera and a tripod. If lost footing I would have slid right into the frigid water. I settled for photographing from the bank of the river. Definitely no sunshine and roses in that scenario! Many of the trees were hanging from the edges of the river bank, barely staying upright. This last image was the one I chose for my best of the week project. All of the images were processed in Adobe Lightroom. I shot from a tripod and bracketed my shots. The Classic Chome Fujifilm Film Simulation preset was applied to each image and the images combined in Photomatix Pro. The Natural filter was applied in Photomatix Pro and the images imported back into Adobe Lightroom for further adjustment. The Tuesday Photo Challenge is a weekly theme-based challenge for photographers of all kinds to share both new and old photography. This week’s theme is rose.